The typical client-agency relationship amounts to the client determining the project and partnering with an agency to get the product tested and built. A weakness of this partnership model is usually a mismatch of expectations, incorrect timing of the feedback loop and intermittent meetings in an attempt to get everyone back on the same page. It’s a notoriously slow process with lots of back-and-forth communication. A team can take months before progressing comfortably together and fully focussing on the user experience. However, the Design Sprint, born of Agile and Design Thinking parents, elicits a whole new way for us to work together which yields far greater results. 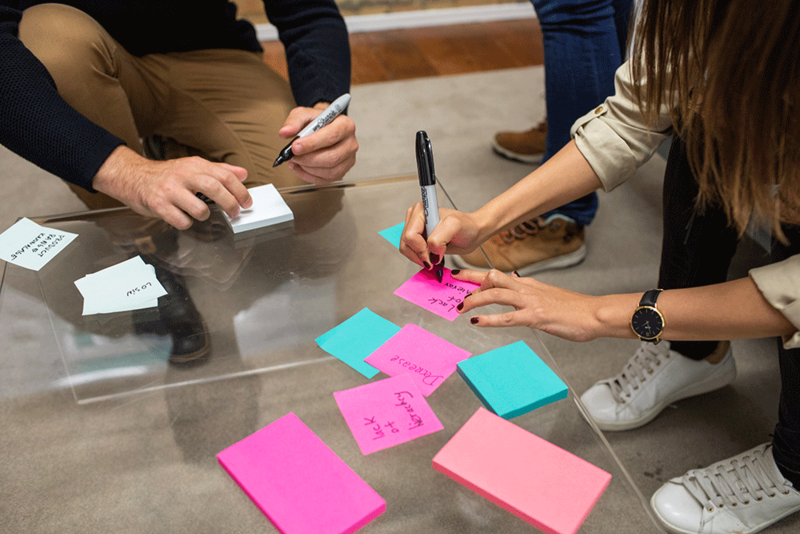 By the very nature of the Design Sprint process, the team is strategically assembled, achieving solidarity, effective communication and the team’s culture is set through the vision with a user-centric focus, culminating in rapid progress. The design sprint team is carefully chosen for the expertise and value each member brings to the project. Listed below are the types of members we’ll mix into the Design Sprint Team, which will be made up of members from our company and yours, and will function at a purely collaboratively level, working side by side together. The role of the facilitator is performed by someone who is not part of the client’s team. This is because strong facilitation is the most crucial element of a design sprint, and success relies on the facilitators ability to provide unbiased, honest and constructive viewpoints which is arguably impossible when the facilitator is part of the company who requires one. Either Katherine Barrow (our CSO), or Dan Olessen ( our UX Lead) from Pixel Fusion, will facilitate the design sprint by guiding the team through each exercise. As we’ve been facilitating Design Sprints for years now, our facilitators know the process inside-out and are incredibly adept at asking the right questions, challenging, motivating, and helping them work together effectively. The Decider is the official decision-maker for the project, and it likely to be from your company as we’ll be working with you to to solve your challanges. It’s arguably the most crucial role to the success of the sprint because the Decider picks the correct problem to focus on and solve in the first place. It’s important to understand that the Decider has to have the most thorough understanding and knowledge of the challenge at hand. These people usually have strong opinions when it comes to the problem, criteria, and the solution, and are brought in for their vision and high level expertise on the subject. When we work with start-ups, it’s either the founder or CEO. At corporate or grovernment level, it’s usually the VP, a product manager, or another team lead. Because of their position in their organisation, the Decider is usually someone whose days are filled with a lot of responsibility, meetings to attend, decisions that have to be made, people wanting their attention and all with little time to spare. Ironically, this is exactly why they are such a crucial part of the Sprint Team. If the Decider is unable to participate in the entire duration of the Design Sprint, they may step in on Day 1 of the sprint, to give the vision and mission of the company and discuss the objectives of the sprint; and on Day 3 when decisions are taken concerning validation on what to prototype. In this case, the Decider would appoint a Proxy to assist with the decisions throughout the remainder of the sprint. This person understands the money trail, business finances, taxes etc. of the product or industry and may be the CEO, CFO or even the Business Development Manager of your company. These are the people who generally judge the quality and efficiency of the design, understand the company brand, and both the sales and strategy of the business aligns with the product. They understand the target audience and help to ensure the impact of the idea. This many be the CMO, Marketing Manager, PR, Copywriter or Community Manager, Researchers, Customer Success Managers, Sales or Support Managers. These experts will be a combination of both companies. Developers are great at finding realistic solutions and simplifying features. These experts will be a combination of developers from both your company (if you have them) and Pixel Fusion. They’ll also play a vital role in the feasibility of the product build, and tech audit for the economy of the build. UX/UI Designers help build and test prototypes effectively, and are specialists when it comes to the user centric approach to solutions. These experts will be a combination of designers from both your company (if you have them) and Pixel Fusion. This may be any person who is assigned into the role by the Decider. The Proxy will regularly update and discuss the progress of the sprint throughout the week with the Decider. This official power transfer adds tremendous clarity to the project and enables the sprint to continue. The Proxy is going to be one of your company members who’s entrusted with this authority. GV refers to the role of the Trouble-maker as an important role to include in the team. Rather than to cause trouble, the role is suited to someone who is smart, with contrary opinions, and the ability to see problems differently from everyone else. This role is likely to be played by one of your company members. Big challenges have a lot of nuance and to have a comprehensive understanding you need to incorporate information from many sources with varying perspectives. Bring in experts who are able to assist with the overall strategy (strategists, architects), understand the customer voice (marketing, sales, support, research), how things work and about delivery. Include anyone who’s already spent time considering the problem in detail and get their insights. Bringing in experts yields a lot of benefits for the team: it reminds them of things they’ve forgotten, provides clarity and irons out details, unleashes surprising insights and helps people feel invested in the design sprint so they look forward to seeing the results – even if they’re only coming in for one afternoon.